The Santa Cruz Basilica has a long-standing and rich history. It all began in the 1500s with the arrival of the Portuguese missionaries along with the second Portuguese fleet who received a warm welcome from the then king of Cochin. This basilica at Fort Kochi in Kerala is one of the eight basilicas in India. As such, it is one of the most significant places of pilgrimage for the Roman Catholic population of India. This lovely basilica is considered as one of the historical and cultural monuments in Kerala, and sees a lot of visitors from all over the world. As mentioned earlier, the history of the basilica goes back to the 1500s, with the arrival of the Portuguese. After the Portuguese were welcomed by the then king of Kochi, the Zamorin of Calicut declared war on the Kingdom of Kochi. But the Zamorin was defeated by the Portuguese army which in turn was given permission to build a fort in Kochi. In 1505, the first Portuguese Viceroy got permission from the king to build a church structure using stones and mortar. This was how the Santa Cruz church came to be built. The church is a charming structure that features two spires and a bright, pastel-hued interior. The structure is a blend of the Indo-European and Gothic styles of architecture, giving this church a vintage quality. The main altar was decorated by the Italian painter Antonio Moscheni, and the columns are adorned with frescoes and murals. Delightful stained glass windows add to the charm and opulence of the church, while the paintings on the ceiling depict scenes from the life of Christ. The loveliness of this basilica is beyond description and you can just sit and wonder about the sense of history and elegance the church still exudes even after so many years. 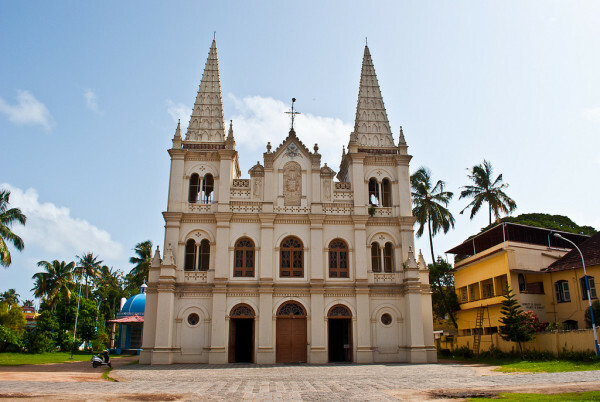 So the next time you want to visit Cochin, make sure you put down Santa Cruz Basilica in the list of places to visit in Cochin. Book one of the hotels in Cochin and start planning your trip right away!